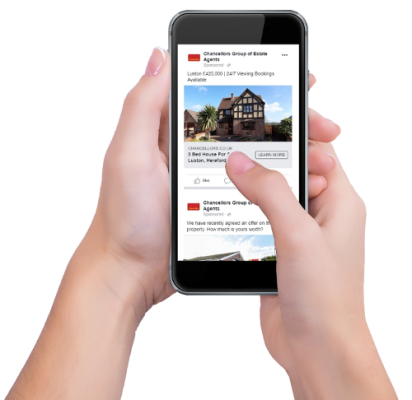 We have recently introduced Facebook Advertising Campaigns to our unique multi-channel marketing package which is available for sellers and landlords instructed on standard contracts during the initial launch to market. Our Facebook Advertising Campaigns are shown to users with similar demographics and interests as our current buyers and tenants. 97% of people who click on our Facebook adverts have not interacted with us before or seen the property previously,* which means we are exposing your property to those most likely to be interested, rather than to people who have seen it before but shown no interest. Included in this target audience are those just starting their property search, so your property will be amongst the first that prospective buyers and tenants see. This is a pool of potential applicants unique to Chancellors, that other estate agents do not have. If you are looking to sell or let your property, please fill in the form below and one of our local property experts will be in contact. *Internal data, 11th March 2019 – 10th April 2019. 974 impressions on average per campaign. Campaigns last approximately 5 days and are applied selectively to property marketing plans depending on the services offered as part of our contract with each client.